Tucson, Arizona is surrounded by natural beauty and awe. From the Saguaro National Park to the Santa Catalina Mountains, you just can’t beat the splendor of the desert. But that’s not all Tucson has to offer. It’s also the home of the University of Arizona (Go Wildcats! ), several gorgeous resorts, real cowboys, amazing cuisine, and a rich literary history. But even in a place as idyllic as Tucson, people can fall on tough times. If you are toiling with debt, know that you are not alone. Roughly 80 percent of Americans are in debt. Fortunately, there are services and techniques you can leverage to escape dire financial straits. Some of the most common debt relief solutions in Tucson include debt consolidation, credit counseling, debt management, debt settlement and bankruptcy. Exploring each and every option to find the best solution to your unique situation can be time consuming and frustrating. Don’t go it alone. Call 800-910-0065 to speak with a certified debt consultant today. You may have heard of debt consolidation before. It’s a popular form of debt relief, after all. But what exactly is debt consolidation? If you have more than $10,000 in debt from multiple creditors, debt consolidation can unite all your dues together, thus making them easier to pay off. Instead of paying off each and every debt while juggling multiple due dates and interest rates, you pay a single lender i.e. your debt consolidation lender. You might even get a better interest rate. However, there are a few things about debt consolidation Tucson residents ought to know. First and foremost, debt consolidation loans often require a high-value asset such as a home or car. If you fall behind on your dues, you could lose this asset. So, stay on top of payments. Second, debt consolidation could have a drag on your credit score. Nevertheless, debt consolidation could be the best move from some Tucsonians. Perhaps your debt is within your capability of paying it down, but it’s not easy to see from your point of view. That’s why it’s sometimes helpful to get an extra pair of eyes on your financial situation. Credit counselors are experts on personal finances and can help debtors build a better budget, investigate their credit score, and find free educational resources. If the credit counselor recognizes debt trends that need attention, he or she will likely recommend a debt management program. While the name might sound scary at first, it’s really a simple service helping debtors pay down their dues in a timely and reasonable way. The key takeaway here is that help is available for those who need it. If you’ve fallen far behind your dues, a more aggressive debt relief strategy might be necessary. Debt settlement services can negotiate with creditors on your behalf to lower the total amount owed on your debt. While the benefits are obvious (paying less than you owe), there are drawbacks too. The first is a negative effect on your credit score. And the second is that the IRS see forgiven debt as a form of income, so you are liable for a tax bill on any settled debt. You may have heard that bankruptcy can resolve many types of debt including unpaid credit card balances, delinquent medical bills, outstanding personal loans, and more. But did you know that the fallout can harm your credit score for years to come? It’s true. Lenders are understandably cautious to offer loans to debtors who couldn’t pay off their past debts. And depending on the type of bankruptcy employed, you may lose your assets (such as your home) to satisfy creditors. Bankruptcy should be treated as a last resort. Investigate other debt relief options before declaring bankruptcy. There may be better solutions for your situation. It can be tough to navigate the variety of debt relief options available to you on your own. Fortunately, there are free resources to assist you. 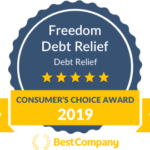 Call 800-910-0065 to speak with a certified debt consultant today; or visit Freedom Debt Relief online to learn more.